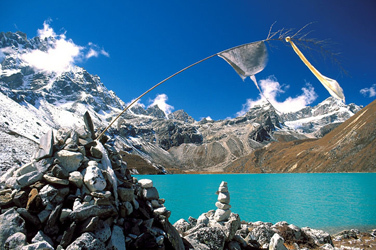 Gokyo trekking, Gokyo Lake trekking is also known as Gokyo Valley trekking and Gokyo Ri trekking, the alternative of Everest Base Camp trekking. It is a short and beautiful trek offer great views of Gokyo valley, Gokyo Lakes, Gokyo Ri and immense views of world’s highest peak mount Everest (8848m) and other wonderful mountains including Mount Cho Oyo, Nuptse, Makalu, Themserku, Ama Dablam, Khumbila, Kwande, pumori and so on. Gokyo Ri (Gokyo Peak) is highest point of our trek located at 5357m and on the west side of the Ngozumpa glacier, which is the largest glacier in Nepal and reputed to be the largest in the whole Himalayas. Gokyo Ri is one of the most amazing viewpoints for great views of Everest and other beautiful mountains. Gokyo Lake Trekking is less crowded and shorter than Everest Base Camp trek. In this trek route people are follows the traditional Sherpa culture and custom intact with Tibetan society. The trek starts from Lukla airport it just 35 minutes fly from Kathmandu airport. The trek pass through the beautiful town Namche Bazaar, it is local business hub traders from Tibet and other villages come with the pieces of arts and goods for sale. The town, maintaining its reputation, is now a tourist hub since it is a gateway to the Himalayas. After Namche, you branch off from the main busy trail towards the sleepy village of Phortse Tenga, Dole and Machhermo. From Machhermo the view are dramatically landscape changing to broad pastures, narrow clefts with steeply climbing trails an icy stream to cross stony wastes and the banks of turns and first lake of the trail continuous to way up stone steps to the third Lake to Dudh Pokhari turquoise in color and reflecting the white face of Mt. Cho Oyu seen ahead and finally reach to your ultimate destination Gokyo Lake (4750m). Next day summit the Gokyo Ri (5357m) then continue trek back to Lukla to finish the trek. What do you think about doing the Gokyo Lake trek? If you want to make the budget trip book the teahouse/lodges package which is cheaper and easy to operate.